VideoCAD has an opportunity of 3D modeling video surveillance scenes using constructions and 3D models distributed with the program. The distribution kit of VideoCAD includes several most relevant models for CCTV design. Though the standard package tends to be enough for accomplishing most of tasks, there may appear a need for library supplement. Any 3D models and scenes which can be opened in Google SketchUp can be added to the VideoCAD library. Lots of 3D models can be downloaded from Internet for free. You can also create models and scenes in Google SketchUp yourself. 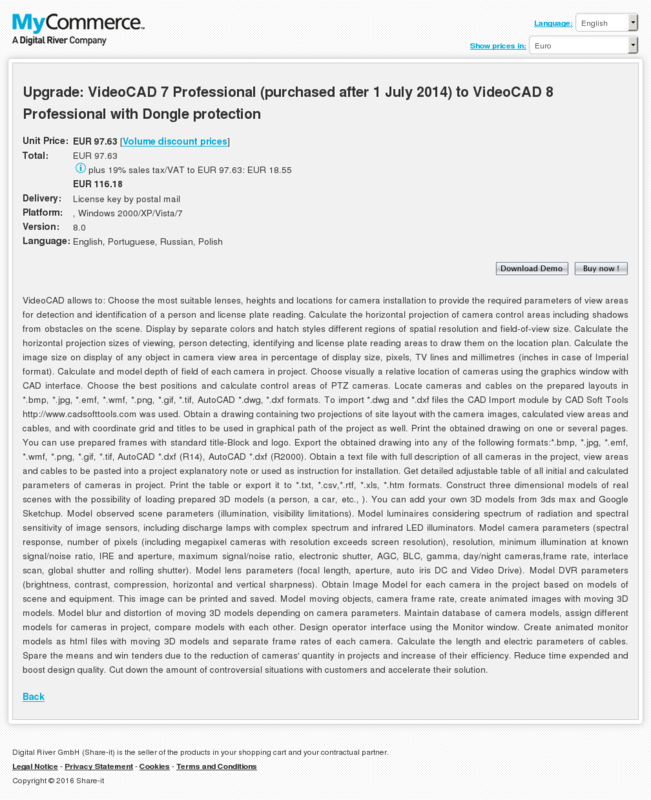 For exporting 3D models to VideoCAD the free SketchUp version is suitable. 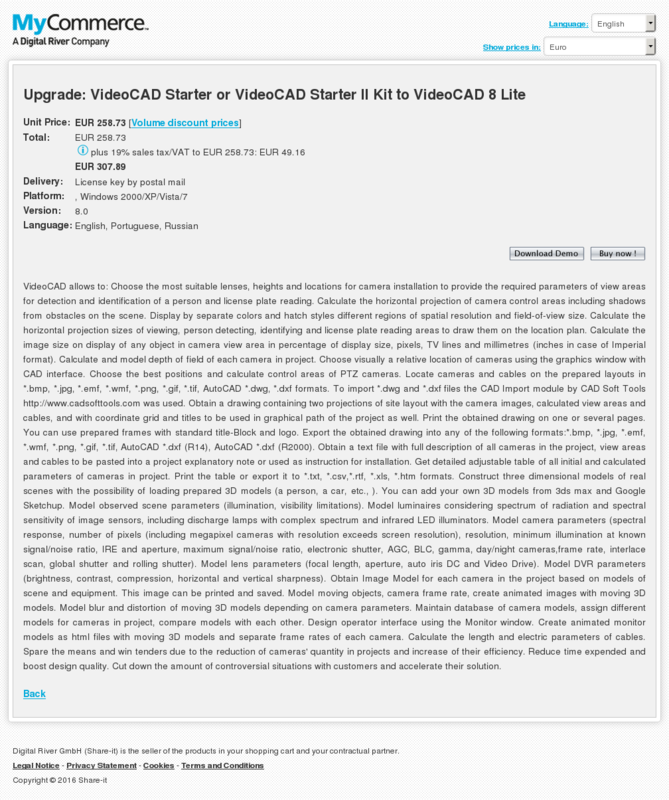 This package contains the Plugin file, the User Manual with step-by-step description how to insert a new 3D model into the VideoCAD library, and example of ready 3D model file. 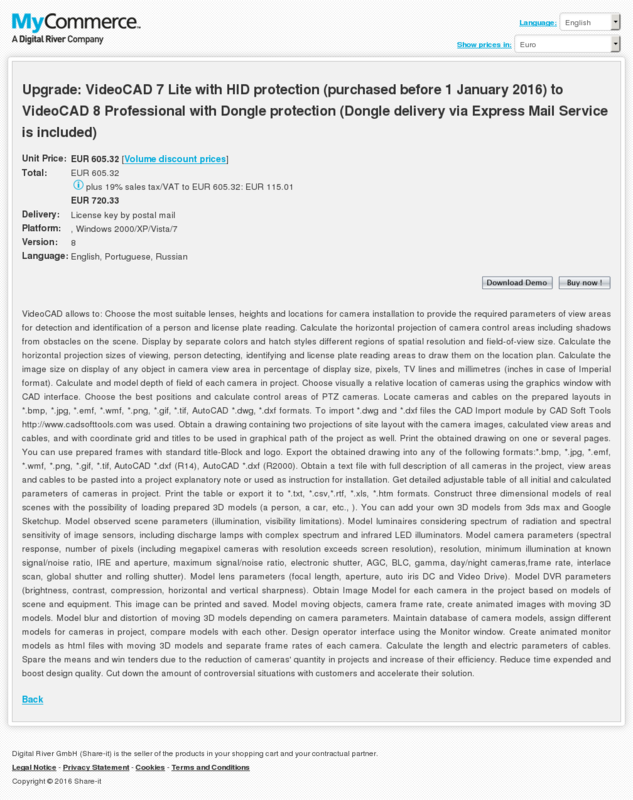 VideoCAD allows to: Choose the most suitable lenses, heights and locations for camera installation to provide the required parameters of view areas for detection and identification of a person and license plate reading. Calculate the horizontal projection of camera control areas including shadows from obstacles on the scene. Display by separate colors and hatch styles different regions of spatial resolution and field-of-view size. Calculate the horizontal projection sizes of viewing, person detecting, identifying and license plate reading areas to draw them on the location plan. Calculate the image size on display of any object in camera view area in percentage of display size, pixels, TV lines and millimetres (inches in case of Imperial format). Calculate and model depth of field of each camera in project. Choose visually a relative location of cameras using the graphics window with CAD interface. Choose the best positions and calculate control areas of PTZ cameras. Locate cameras and cables on the prepared layouts in *.bmp, *.jpg, *.emf, *.wmf, *.png, *.gif, *.tif, AutoCAD *.dwg, *.dxf formats. 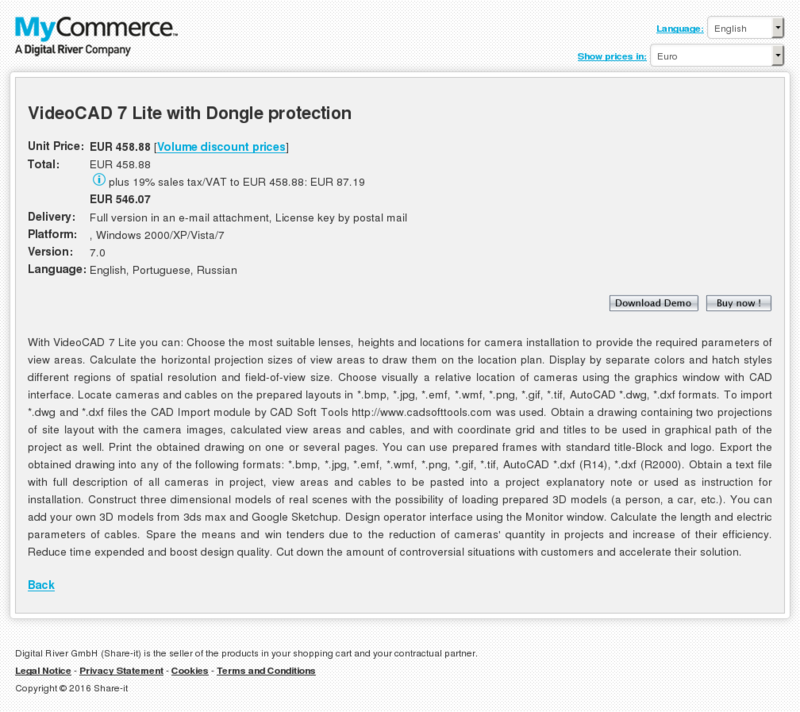 To import *.dwg and *.dxf files the CAD Import module by CAD Soft Tools was used. 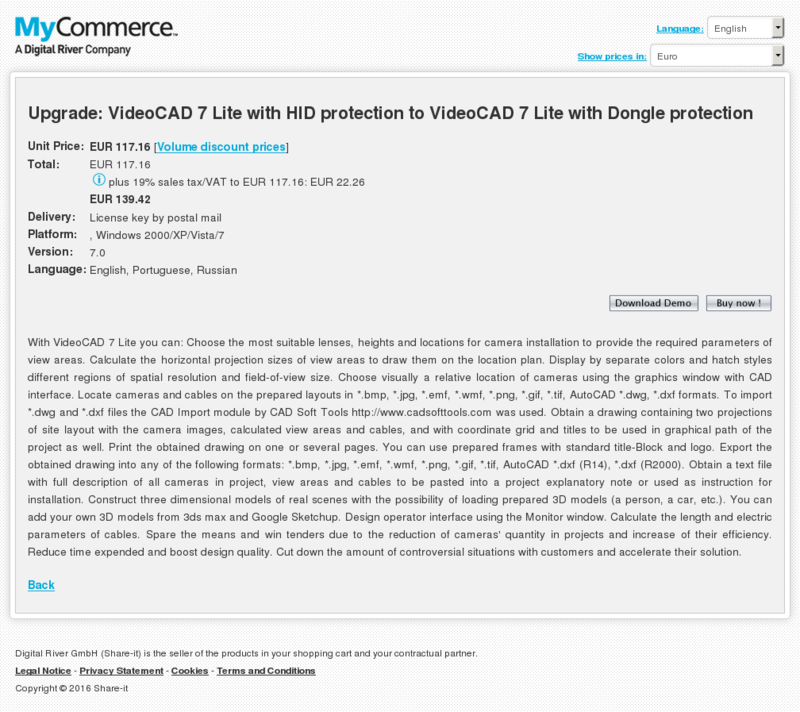 Obtain a drawing containing two projections of site layout with the camera images, calculated view areas and cables, and with coordinate grid and titles to be used in graphical path of the project as well. Print the obtained drawing on one or several pages. You can use prepared frames with standard title-Block and logo. Export the obtained drawing into any of the following formats:*.bmp, *.jpg, *.emf, *.wmf, *.png, *.gif, *.tif, AutoCAD *.dxf (R14), AutoCAD *.dxf (R2000). Obtain a text file with full description of all cameras in the project, view areas and cables to be pasted into a project explanatory note or used as instruction for installation. Get detailed adjustable table of all initial and calculated parameters of cameras in project. Print the table or export it to *.txt, *.csv,*.rtf, *.xls, *.htm formats. Construct three dimensional models of real scenes with the possibility of loading prepared 3D models (a person, a car, etc., ). You can add your own 3D models from 3ds max and Google Sketchup. Model observed scene parameters (illumination, visibility limitations). Model luminaires considering spectrum of radiation and spectral sensitivity of image sensors, including discharge lamps with complex spectrum and infrared LED illuminators. Model camera parameters (spectral response, number of pixels (including megapixel cameras with resolution exceeds screen resolution), resolution, minimum illumination at known signal/noise ratio, IRE and aperture, maximum signal/noise ratio, electronic shutter, AGC, BLC, gamma, day/night cameras,frame rate, interlace scan, global shutter and rolling shutter). Model lens parameters (focal length, aperture, auto iris DC and Video Drive). Model DVR parameters (brightness, contrast, compression, horizontal and vertical sharpness). Obtain Image Model for each camera in the project based on models of scene and equipment. This image can be printed and saved. Model moving objects, camera frame rate, create animated images with moving 3D models. Model blur and distortion of moving 3D models depending on camera parameters. Maintain database of camera models, assign different models for cameras in project, compare models with each other. Design operator interface using the Monitor window. Create animated monitor models as html files with moving 3D models and separate frame rates of each camera. Calculate the length and electric parameters of cables. Spare the means and win tenders due to the reduction of cameras’ quantity in projects and increase of their efficiency. Reduce time expended and boost design quality. Cut down the amount of controversial situations with customers and accelerate their solution. With VideoCAD 7 Lite you can: Choose the most suitable lenses, heights and locations for camera installation to provide the required parameters of view areas. Calculate the horizontal projection sizes of view areas to draw them on the location plan. Display by separate colors and hatch styles different regions of spatial resolution and field-of-view size. Choose visually a relative location of cameras using the graphics window with CAD interface. Locate cameras and cables on the prepared layouts in *.bmp, *.jpg, *.emf, *.wmf, *.png, *.gif, *.tif, AutoCAD *.dwg, *.dxf formats. 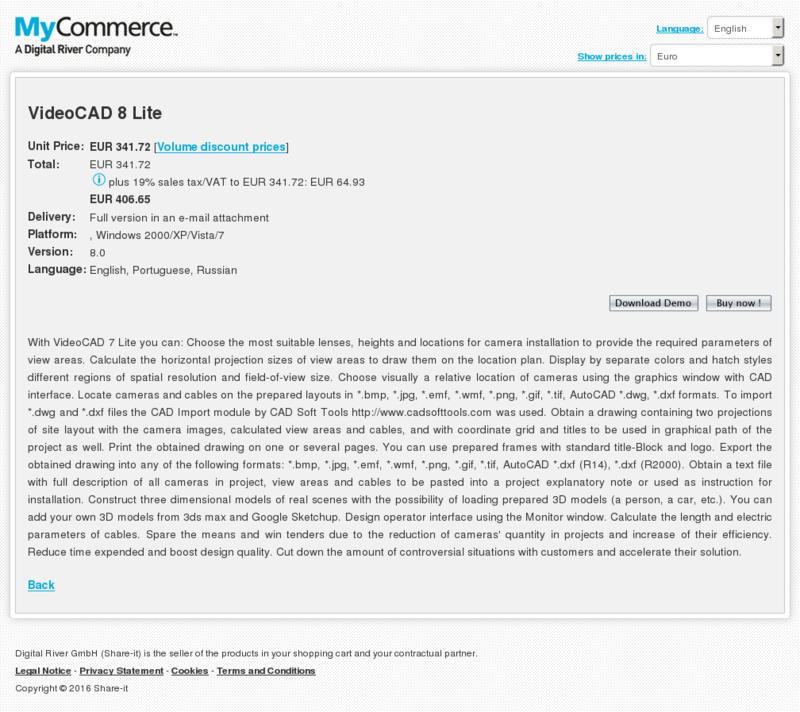 To import *.dwg and *.dxf files the CAD Import module by CAD Soft Tools was used. Obtain a drawing containing two projections of site layout with the camera images, calculated view areas and cables, and with coordinate grid and titles to be used in graphical path of the project as well. Print the obtained drawing on one or several pages. You can use prepared frames with standard title-Block and logo. Export the obtained drawing into any of the following formats: *.bmp, *.jpg, *.emf, *.wmf, *.png, *.gif, *.tif, AutoCAD *.dxf (R14), *.dxf (R2000). Obtain a text file with full description of all cameras in project, view areas and cables to be pasted into a project explanatory note or used as instruction for installation. Construct three dimensional models of real scenes with the possibility of loading prepared 3D models (a person, a car, etc.). You can add your own 3D models from 3ds max and Google Sketchup. Design operator interface using the Monitor window. Calculate the length and electric parameters of cables. Spare the means and win tenders due to the reduction of cameras’ quantity in projects and increase of their efficiency. Reduce time expended and boost design quality. Cut down the amount of controversial situations with customers and accelerate their solution. 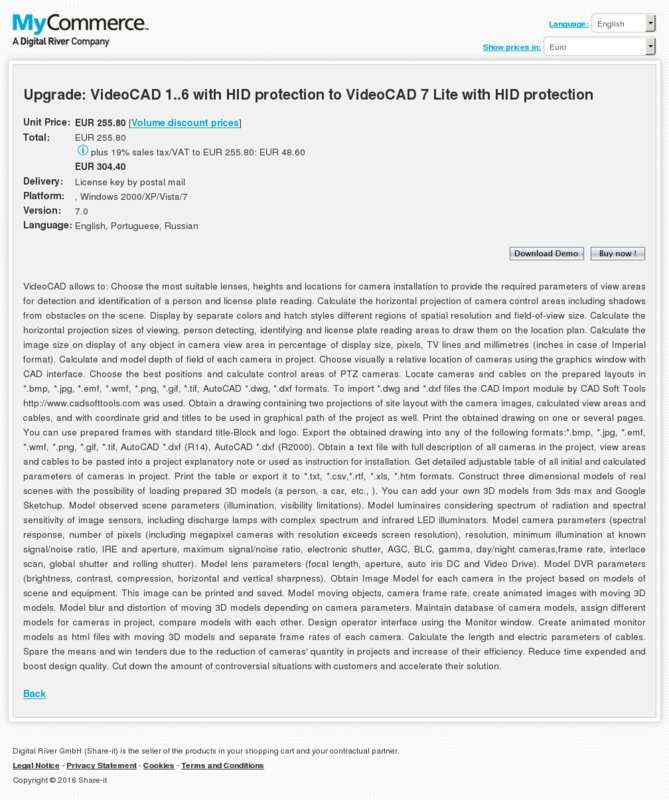 With VideoCAD 7 Starter II you can: Choose the most suitable lenses, heights and locations for camera installation to provide the required parameters of view areas. Calculate the horizontal projection sizes of view areas to draw them on the location plan. Display by separate colors different regions of spatial resolution and field-of-view size. Choose visually a relative location of cameras using the graphics window with CAD interface. Locate cameras on the prepared layouts in *.bmp, *.jpg, AutoCAD *.dwg, AutoCAD *.dxf formats. 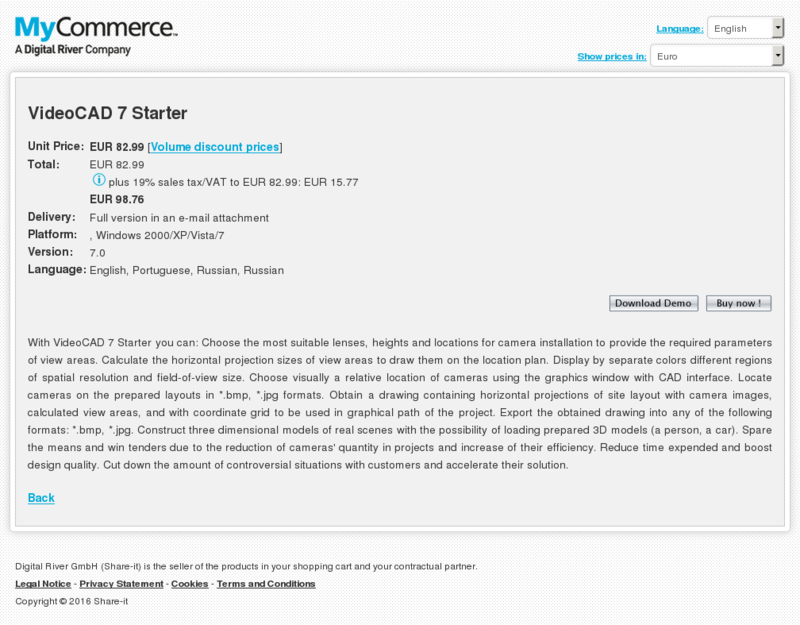 Obtain a drawing containing horizontal projections of site layout with camera images, calculated view areas, and with coordinate grid to be used in graphical path of the project. Export the obtained drawing into any of the following formats: *.bmp, *.jpg. Saving the drawing in the Graphics windows with resolution exceeding Windows screen resolution. Copy the Camera list with most important parameters to MS Excel, MS Word and other software. Construct three dimensional models of real scenes. Use many 3D models (people, cars, bus, furniture, turnstile, tree, grass). You can add other 3D models from 3ds max and Google Sketchup. Spare the means and win tenders due to the reduction of cameras’ quantity in projects and increase of their efficiency. Reduce time expended and boost design quality. Cut down the amount of controversial situations with customers and accelerate their solution. With VideoCAD 7 Starter you can: Choose the most suitable lenses, heights and locations for camera installation to provide the required parameters of view areas. Calculate the horizontal projection sizes of view areas to draw them on the location plan. Display by separate colors different regions of spatial resolution and field-of-view size. Choose visually a relative location of cameras using the graphics window with CAD interface. Locate cameras on the prepared layouts in *.bmp, *.jpg formats. Obtain a drawing containing horizontal projections of site layout with camera images, calculated view areas, and with coordinate grid to be used in graphical path of the project. Export the obtained drawing into any of the following formats: *.bmp, *.jpg. Construct three dimensional models of real scenes with the possibility of loading prepared 3D models (a person, a car). Spare the means and win tenders due to the reduction of cameras’ quantity in projects and increase of their efficiency. Reduce time expended and boost design quality. Cut down the amount of controversial situations with customers and accelerate their solution.